Gulabi gang is the name of a gang of women in India, that on call beats up abusive husbands with brooms. “Gulabi Gang” is a gang of women in India who track down and beat abusive husbands with brooms. The people of Bundelkhand, Uttar Pradesh, daily have to fight a battle for survival as they somehow try to manage with the infertile land, a corrupt judicial system, and India’s oppressive, outdated caste mechanism. It is a known fact that India is still not a pleasant place for females to live freely and Domestic violence is an extension to the miserable conditions of women in India. 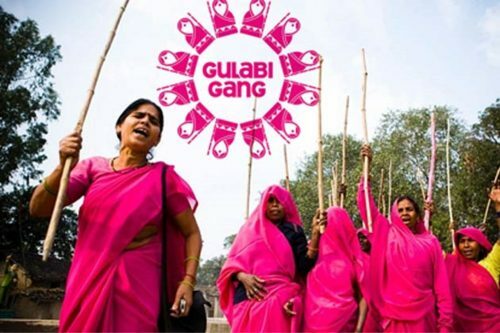 Considering these aspects, The “Gulabi gang” a group of Indian women activists, formed in 2006, by Sampat Pal Devi, came forward as a response to widespread domestic abuse and other violence against women. The women of the “Gulabi Gang” are not actually a gang, they are a group of women wearing pink sarees that symbolize strength and carry around bamboo sticks and brooms that can be used as weapons if needed. Most of the women are from a poor background and the lowest caste, the Dalit. The founder of the group, Sampat Devi, started the group after having beaten an abusive husband. Since then, women have joined their hands together to punish oppressive and abusive men, the women scolded men who abused their wives and also publicly humiliated them. In some cases, they even went further and threatened the abusive husbands with laathis or bamboo sticks to teach them a Lesson on respecting their wives and to put an end to the domestic violence. Being a popular and guaranteed source to eliminate the violence and abuse, the group achieved national recognition and was honoured by The Kelvinator 11th GR8! Women Award, an award offered by the Indian Television Academy. They also earned the Godfrey Phillips Bravery Award for social bravery, offered in Uttar Pradesh, Uttarakhand, and Delhi. The gang holds a heavy support from more than 250,000 women as figured by The Hindustan Times. And the figures are still increasing to flash off the domestic abuse and violence. Next articleOne of the co-founder of Apple, Ronald Wayne sold his 10% share for $800 in 1976 — Which is now worth over $35 billion.